Eighteen months on and my life has changed. Through caring for the horses, I've learnt that I need to care for myself; there is much more to life than just school work and obsessions over food. The horses are a wonderful comfort. I love to cuddle them and feel their warm breath on my face or riding on a summer evening. You see things from a different perspective on a horse's back. I met new people and made friends. Having struggled myself made me determined to encourage others to see that they could overcome the obstacles in their lives. I started to see the progress that I was making. How could I be so strong and determined to help others if I did not practice what I preached? This year I am applying for university. It's a huge milestone that many thought my illness would prevent me from reaching. I feel privileged to be a part of Ride High." Rachel Medill, founder of Ride High, worked with Cameron when he first arrived at Ride High. He wouldn't pick up a pencil. He wouldn't look anyone in the eye and refused to take part in activities. His first response to everything was no. Cameron remembers, "When I first started at Ride High I found the people more intimidating than the horses. I remember arriving at my Ride High sessions feeling bad, but I always left in a good mood. Just being around the horses made me feel so much better. My favourite horse was Quincy. I absolutely loved him. He's a Norwegian Fjord pony so he's got a really cool mane. I managed to talk to the Club Leader a little bit, and eventually I started to feel better around the other children in my group. My biggest challenge was the trip to Badminton Horse Trials. There were so many people there, such big crowds of strangers, but I really enjoyed it". 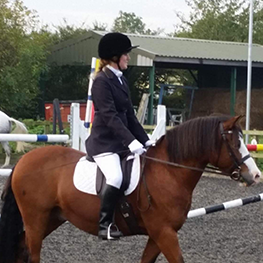 Rachel remembers, "As we walked around the stalls and displays at Badminton he started to speak to the stallholders. He was asking questions of strangers and I couldn't quite believe it! It was a massive step forward for him". 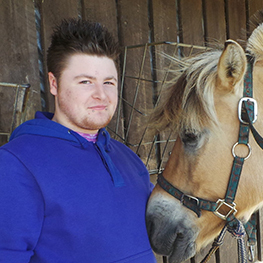 In summer 2014 Cameron finished his course in Animal Care, Levels 1 & 2, at Moulton College: "We had to do a presentation in front of the whole class. It was terrifying but I managed it. I wouldn't have been able to do it without Ride High because we did lots of activities where we had to talk in front of other people and work in teams". 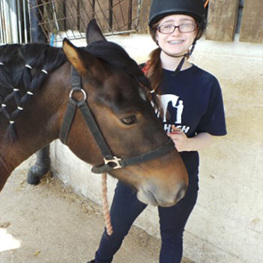 "Because of Ride High I am more confident at talking to new people and am able to be myself around them. Without Ride High I don't think I would ever have gone to college and made new friends. I'm still in touch with some of them today. My life has changed so much because of Ride High." It was such an amazing experience as different horses have their own personality. I learnt a lot at Ride High that I will never forget. Trips out were so much fun and I was able to be a part of the fundraising helping the charity. It felt nice to help the charity which has helped me in so many ways. In 2011 I was an ambassador at the Ride High Ball with over 300 guests. I was interviewed by Jeremy Vine and felt really confident. For the first time I felt proud of who I was and who I had become with the help of Ride High. I struggled with meeting new people but Ride High introduced me to some amazing and friendly people who I have become great friends with." 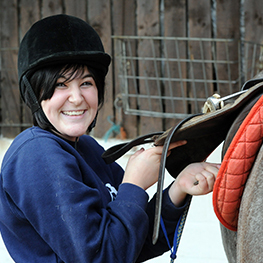 "I was 16 when I was first referred by CAMHS to Ride High mainly to help escape from my intrusive thoughts. Being such a high risk to myself, I wasn't allowed to be alone. Therefore I stayed with my mum 24/7. Ride High gave me that alone time. I've always had a love for animals but Ride High brought out my love for them even more. My favourite thing would be to come see the horses each week whilst getting such amazing support from the staff there. I was offered space when I needed it, someone to talk to when I needed it and I was even given one of my favourite pony's shoes the day I left which I will keep forever. I spent two years at Ride High and in that time my confidence grew more than it had before, I finally found something I loved in life and my little world didn't seem so dark anymore. I left Ride High about a year ago but I haven't stopped horsing around! I am well into my recovery and I now fully loan my dream gelding who I ride dressage competitively on and has taught me to jump 3ft without any fear. I wouldn't have been able to do it without Ride High. Thanks to the charity I am myself again with a bonus new best friend!" "I was 14 when I started at Ride High. My school referred me after I'd been emotionally bullied by people who I thought were my friends. It completely destroyed my self-confidence and I became very depressed and anxious. At Ride High the people and the environment were really friendly and I could tell the horses anything because I knew they would never judge me. Going to Ride High improved my confidence tenfold so much so that I went to a new school for sixth form. Something I thought I could never do. I also learned to manage my anxieties better. I used to worry about every little thing, and I still do sometimes, except now I know how I can deal with how I'm feeling. After I was bullied I felt that I couldn't trust anyone. Ride High taught me how to trust again and that it's important to talk about my problems. I now have a strong friendship group and have become a more optimistic and confident young woman. 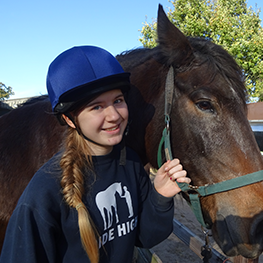 My time at Ride High made me realise that I want to work with animals and without it I definitely wouldn't be at Sixth Form doing my A' levels with a view to going to the University of Surrey to study veterinary medicine.